Japan's much loved Nakasendo Trail hosts a long line of post towns that have perfectly retained a slower and more traditional pace of life. Taking the Shinkansen in Japan is a magical experience no matter where your destination is but perhaps none is more important than the country’s flagship route, Tokyo - Osaka/Kyoto. In this vein, and before the advent of air travel or even rail journeys, the most trafficked city pair was he route between Japan’s old imperial capital in Kyoto and the Emperor’s newly favoured port town of Edo. Back in those days, travelling was confined to the inherent limitations of human muscles. Well that’s unless you were a baller in 17th century Japan in which case; the richer you were, the bigger your palanquin. But where did these palanquins go exactly? Two competing routes between Kyoto and Edo vied for the fancy of ‘commuters’, the Tokaido and the Nakasendo. Pragmatically, the Tokaido was the ‘better’ route as it was 25km shorter and didn’t require travelling through the treacherous and hilly terrain. Yet, for ordinary travellers, the Nakasendo (as it winded through the Kiso Valley) was the more preferred ‘overland route’ between the two cities because it meant that there were no rivers to ford over. The Tokaido, though benefitting from a more direct route (which is why the Shinkansen uses it), required travellers to cross a number of harrowing bridges due to the number of rivers situated along the route. Crossing rivers with the technology of the day meant that travellers would have to be ferried across by boats or carried by porters - where both methods susceptible to weather conditions and the fast flowing currents of the river. Better to endure a few more days of travel and lower temperatures than being swept into the open sea right? Using the Nakasendo Way also had the added benefit of avoiding the many processions of feudal lords using the Tokaido and the associated pageantry it would be accompanied with. But there has to be a reason why I’m writing about a random road linking two cities together right? Well, other than fact that I got to sample a part of the historic Nakasendo while I was in Japan, I thought that it was interesting that on the Nakasendo, a series of 47 (yes that’s right) 'post towns' popped up on the route between Kyoto and Edo - no small feat/phenomenon for such a small country. But why did such a complex set of infrastructure develop in an age where the volume of travel (and indeed the population sizes) between cities wouldn’t conceivably be that high? These 47 post towns or Nakasendo villages, became a means of political control in which the shogunate could regulate and monitor the flow of traffic between cities. However, the less sinister (and primary aim) of these stops were to cater to the passengers traversing the route by supplying them with food, drinks, entertainment and accommodation. In essence, the flourishing of post towns all came down to the Shogunate’s implementation of a system coined sankin-kotai or alternate attendance which necessitated local feudal lords (daimyos) to travel between their home domains and the capital in Edo. The law promulgated by the ruling Tokugawa shogunate mandated that every feudal lord or daimyo were required to spend alternate years in the capital and in their fiefs. The motive? To strengthen and centralise the control of the ruling shogun over the various provinces across the country. Think this system is overly harsh? It gets worse. When the daimyo was allowed to spend time in his local domain, it was time for his wife and designated to travel to and remain in Edo as imperial hostages on usually benevolent terms unless things got dicey. Not only did this disincentivise any rebellion effort from a psychological perspective, the cost of making these long trips meant that the daimyo’s finances were severely impaired. And if you were to go a step further, the domains that were furthest away (and hence more able/likely to rebel) would be the most financially hurt due to the greater logistical and financial resources needed to make the sankin-kotai. With Japan housing several hundred daimyos across its provinces, it was essential to have well paved roads and ancillary infrastructure to facilitate the constant journeys to and from the capital. As if often the case in small towns, it was also prudent that not too many daimyos would show up at the same time needing to stay the night lest a lack of capacity for the best rooms meant that these venerable officials would have to make do with lower quality accommodation. And if one would at this point wonder where the roots of Japanese efficiency and precision comes from, perhaps the ability of inn keepers to coordinate the schedules of top officials visiting their first class inns without modern technology is a fantastic primer for it. Yet, the unforeseen impact of such an arrangement resulted in the post towns becoming conduits of interaction across social classes even though it must be said that the stratification of social classes still remained an ossified feature of Japanese society for quite a while after. However, as the years went by, this feature of Japanese society began to lose its relevance. Additionally, and just like other Confucian style societies in the region, the rising prominence of inn and shopkeepers as merchants worked to upturn the prevailing social arrangements of Japanese society where profit-seeking merchants were placed at the very bottom of the social hierarchy. The flourishing of the post towns also opened up opportunities for travel to other segments of society and hence created the conditions that led to the accelerated development of roads, highways and bridges across the country during the Meiji Restoration. By that time, many were already acquainted with intercity travel and by extension, sort of explains why Japan was able to achieve such a remarkable rate of growth during the period. By extension, the introduction of railroads while innovative from a business perspective, had more of a gradual effect on Japan when compared to how it radically changed mindsets in other countries. At present, many parts of the Nakasendo were either left to ruin or were redeveloped into highways. Yet, it seems prudent that some areas of this historic Japanese artery has been preserved for posterity. Indeed, it is important to retain its heritage especially in view of the immense cultural and social impact it has had on the country. 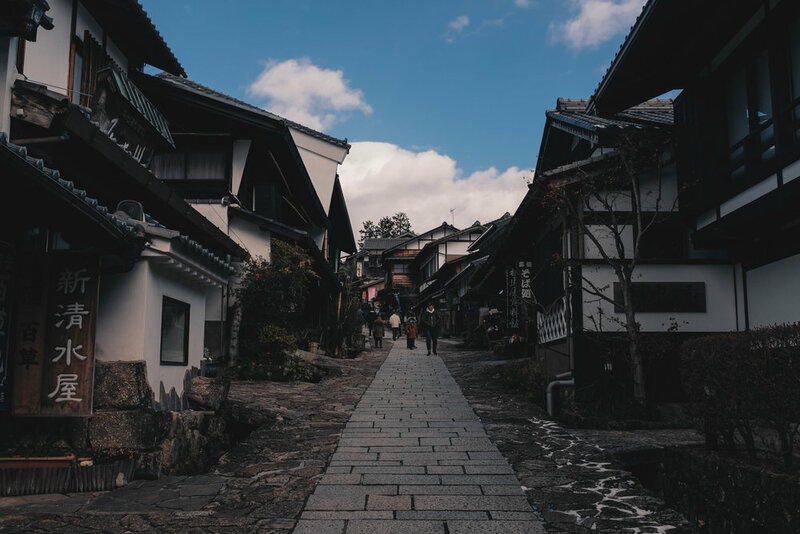 The Nakasendo due to its largely mountainous roads have lost most of their former glory, but for visitors wanting to get a slice of its history can visit the post towns of Tsumago, Magome and Narai which are situated in the Kiso Valley of Japan. These three towns were deliberately (and decisively) preserved for future generations and depict the towns during their heydays with the traditional wood houses and architecture intact. Alternatively, the timeless novel, “Before the Dawn” by Toson Sjimazaki chronicles the fate of these three infamous post towns. Most tourists take the 2/3 hour walk between Tsumago and Magome as it is considered one of the nicest walks in the country; unless you’re visiting during Winter and if so, you won’t be able to last more than 30 mins without a source of heat. Japan's hiking trails are notoriously harsh during breezy winters. You can actual do the ‘greatest hits’ of the Nakasendo trail => from Kyoto and Tokyo through a mix of train journeys, buses and walking but these (often) guided tours are expensive and not for those looking for a restful day or two away from the city. I’ve found that visiting the aforementioned three famous post towns in the Kiso should satiate your interest in the area. Narai was supposedly the richest and swankiest of the post towns which apparently had a 1000 inns during its heyday. However, when I was there, almost everything was closed due to the frigid temperatures. I’m not sure if the Samurai needed gloves back in those days but I sure as hell did. Though not so evident during Winter, Narai has been very well preserved by the local community with support of the Japanese government. I'd recommend visiting in Spring when the weather is more comfortable and when there's actually people in town. Walking past the many shuttered shophouses, I saw small family-run provision/gift shops and also eateries selling sweets and snacks. As Narai is usually outside of the main Magome - Tsumago link, you'll probably have to do a self guided tour of this part of the Nakasendo Trail. Click here for a map of the Nakasendo Trail. I didn’t spend much time in Tsumago but what I can say that it is a smaller version of Narai-juku but with less forgiving weather as the town’s streets essentially allow cold winds to billow through them causing some pretty intense wind chill. There was however, a bunch of kids who were going hysterical over the Pokemon battle that was going on and none of them seemed to need more than two layers of clothes to brave the freezing temperatures. As mentioned, visiting Tsumago during Spring is ideal as you'll actually be able to visit the town's many points of interest that include shrines and museums. If you're thinking of embarking on the Tsumago-Magome trail, there is a luggage forwarding service available. This is also complemented by the availability of accommodation through the small inns and hotels in Tsumago and Magome. Most tourists (and their tour buses) focus their efforts on Magome perhaps due to the more hilly terrain the town is situated on. As such, by exploring the town, visitors are treated to nice views that come from great vantage points, whether its of the valley or the surrounding mountains in the region. A hike across town also provides for a much needed breath of fresh air from the mountains - something we all really do need once in awhile. There are also various shops and eateries lining the main road and also along the footpaths selling regional wines, sweets and snacks. Kitschy memorabilia of Japan is not in short supply here, but the souvenirs worth buying are the region’s artisanal utensils and lacquer lunch boxes. All in all, the views of and from Magome make it one of Japan's most beautiful towns. Nakasendo was originally favoured for the construction of the railway between Tokyo and Kyoto because of a developmental imperative as there was a pressing need to develop the mountaineous areas around Nagano. The military also supported the plan in view of its more defensible inland route. However, the ‘inefficiencies’ (and challenging terrain) of the Nakasendo meant that modern innovations in travel like the Shinkansen decided to follow the more direct Tokaido instead. Yet, with the commercialisation of the Tokaido, this meant the beauty of the Nakasendo’s post towns in the Kiso Valley and the various hiking trails branching out from it became preserved due to a lack of use. Indeed, many also consider the Nakasendo Walk as one of Japan's best walking tours. With all that it has done for Japan's economic and social development (not to mention its natural beauty), missing a trip down to any section of the Nakasendo would be folly for anyone that's nearby anyway. And so, what're you waiting for? Let's walk Japan's Nakasendo Way. PS: If you'd like a more in-depth and practical guide about the Nakasendo, refer to this blog.